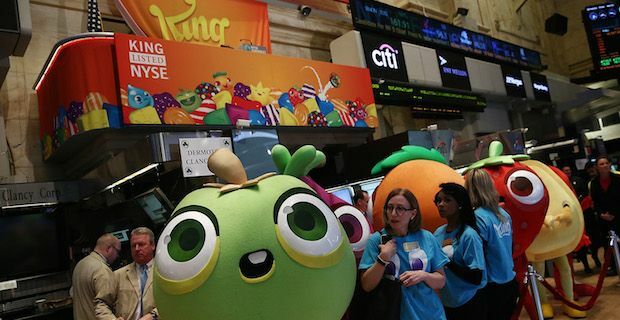 King Limited, developers of the international hit game Candy Crush Saga, had a difficult first day of trading on the New York Stock Exchange. In fact, King Limited's IPO marks the worst opening day trading so far in 2014. 22.2 million shares were offered at $22.50 apiece and the shares finished the day trading at $19.08. This marked a fall of $1 billion in King's market value as investors tactically waited for share prices to tumble before purchasing. It seems that investors are all a little worried about King Limited's dependence (or over dependence)on Candy Crush Saga while not having any other of their 180 games show signs of replicating the success of the Candy Crush game. There are promising signs though that the game Farm Heroes Saga is looking like it will be one of the mobile hits of 2014 with huge download numbers since its launch in January. After a rocky start from its inception in 2003, King began to turn a profit in late 2005 and has remained profitable ever since. The company reported revenue exceeding $1.8 billion in 2012. Most of this, however, is heavily dependent on Candy Crush Saga with over 75% of company revenue coming from the smash hit. This floatation is the latest in a series of moves King Limited have made to cement the company's place at the top of the mobile gaming pile. Earlier in the year, King Limited even went as far as trademarking the word 'Candy' in a move designed to protect their intellectual property.